This week at the farmer’s market: Asparagus – A. officinalis. One of the oldest vegetables found in records of the farm. Maybe it came from Asia Minor or the Middle East. 4000 years ago the Chinese already knew of it. Nefertiti is rumored to have called it “the food of the gods.” In Pompeii, murals were found illustrating asparagus. In Rome they dedicated it to Venus and claimed it was an aphrodisiac. It is in the Asparagaceae family and its relatives include onions, garlic, tulips, daffodils, chives, leeks, etc. Asparagus is quite healthy. Its diuretic properties help remove salts from the body. It has anti-oxidants (to keep you youthful) and folates. Asparagus is full of vitamins like B-complex, B6, A, C, K, E, and minerals like copper and iron. It could help relieve a hangover because it contains certain enzymes that break down alcohol. And if that isn’t enough, for women, it may relieve PMS symptoms because it has so much calcium. One thing that some people discover after consuming a lot of asparagus: the plant causes a strange aroma in urine. This happens because your body breaks down the vegetable’s asparagusic acid and this turns into different chemicals that contain sulfur. What’s interesting is that only about 25 percent of people can detect the strange smell (or produce it. It’s genetic). Another weird thing about asparagus cultivation is that if you cover the just-shooting-up asparagus with about six inches of dirt (depriving them of light) their photosynthesis will pause and they’ll turn out pale like deep sea fish. When you “pick” asparagus, snap them at the base, or cut them close to the ground. The colder the weather the better the flavor. Once it starts to warm they aren’t as delicious. 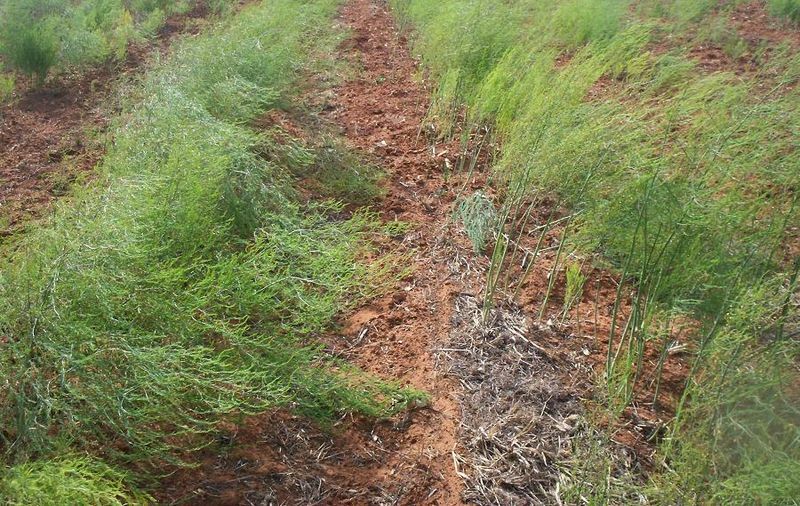 Wild asparagus can be found in ditches along the Iowa roadside and other untended places. The wild variety are usually the result of windblown seed of the cultivated kind. They are a bit skinnier but still good for eating ( actually known to be more flavorful than garden variety). I have a friend who, in late summer, scouts the country roads around his house for asparagus “bushes” gone to seed (full grown they can be 5 feet tall). That way he knows where to look in the early spring when the vegetables are harder to spot but better to eat. You can also train your eye to recognize the old dead asparagus in early spring to find the fresh shoots underneath. You should get it as close to harvest as possible because it loses sweetness the longer it is out of the ground (sugar turns to starch). At market pick the tender, yet firm, smooth and straight, dark green shoots with purplish closed tips. The ones to avoid are wide with ridges that are not as brightly colored because they’re probably older and less flavorful. I like to stir-fry them or steam them and they are really good with various butters.